1. 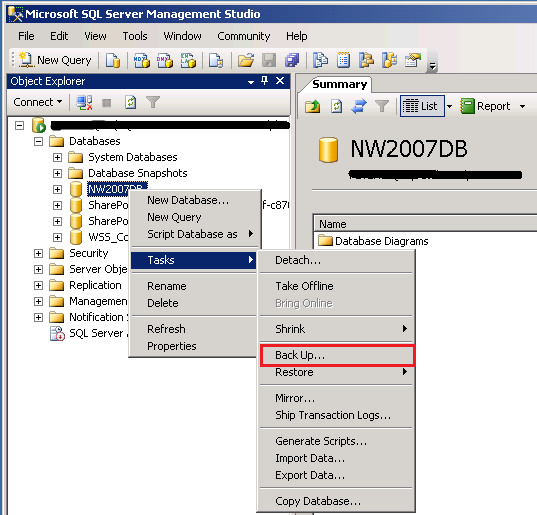 Login to the SQL Management studio where the current Nintex dayabase is present.And performa back up of the Nintex database (Right click on your Nintex database ->Tasks->Back Up).Click OK on the next screen. This saves a backup of the NW2007DB to the default directory of "C:\Program Files\Microsoft SQL Server\MSSQL.1\MSSQL\Backup\" under the filename NW2007DB.bak. NW2007DB.bak file to the directory "C:\Program Files\Microsoft SQL Server\MSSQL.1\MSSQL\Backup\"
On From device and then specify File -> Add .Browse for the backed up file NW2007DB.bak. The database is now moved to the new server and is ready to be connected to by Nintex Workflow. 2. Below Configuration Database,click Edit. 3. Enter the new details and choose Connect to existing database.Click OK.
1. From the database management screen, you will see that the content databases still point to the old server. 2. On the server where you installed the Nintex Workflow 2007 msi, open a command prompt window. 3. Change Directory to the directory in which you installed Nintex Workflow. 4. Restart IIS and the Windows SharePoint timer service . 5. Check the database management page again, the content database references should be up to date. 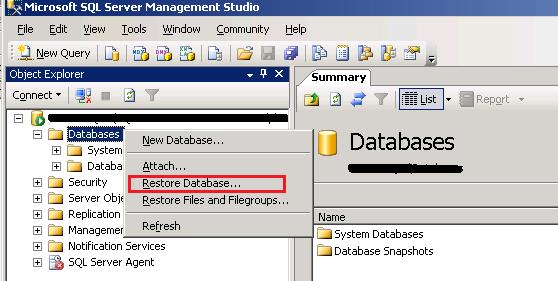 Note : If for some reason you need to manage the content database servers manually, you can also do so by modifying the database directly. This has the same effect as running the NWAdmin command. 1. Open the configuration database in your database management tool. 2. Open the table called “databases”. 3. You will see the content database details listed. You can update the Server name column as required and submit the change. Restart IIS and the Windows SharePoint timer service from services.msc and the process should be complete. does these steps above preserve the nintex woirkflow history on Destination server ? i mean can i still go into destination server and click on the "view workflow history" link and see the WF history of the completed WF on the destination server same as i was seeing in source server ?